Gynemed е водещ немски производител в сферата на продуктите за асистирирана репродукция и гинекологична хирургия. Продуктвата линия GM501 Меdia Line обхваща кулкурални среди, среди за обработка на сперма, среди за криосъхранение и ин витро диагностика, ензими, реактиви за потготовка и др. GM501 Wash is ready-to-use media designed for washing procedures of human oocytes and embryos and any short-term handling procedures outside the incubator like washing after Hyaluronidase treatment (denudation), ICSI, polar body or blastomere biopsy and others. 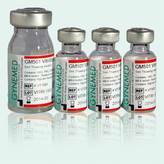 GM501 Basic with Gentamicin is a bicarbonate buffered cell culture medium, designed for fertilisation and for all embryo culture from day 1 to blastocyst stage. It can also be used for embryo transfer. Addition of human albumin solution (1 %) by the customer is required for optimal culture conditions. GM501 Cult with Gentamicin and Phenolred is ready-to-use bicarbonate-buffered culture media, designed for fertilisation and for human embryo culture from day 1 to blastocyst stage. It can also be used for embryo transfer. GM501 SpermActive is a ready-to- use medium designed for all human sperm preparation, sperm washing and swim up techniques like density-gradient centrifugation as well as for testicular tissue. GM501 Gradient 100 % consists of silane-coated colloidal silica particles suspended in HEPES-buffered medium. GM501 Gradient 100 % can be used in combination with IUI, IVF and ICSI. 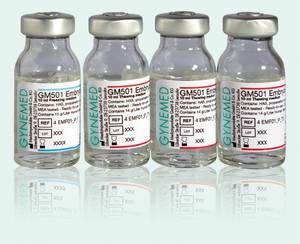 GM501 EmbryoStore is a set of ready-to-use media for freezing and thawing human embryos between 2PN and 4 cell stage. GM501 SpermStore is a medium for freezing human sperm including epididymal or testicular sperm. GM501 VitriStore Freeze/VitriStore Thaw are a set of ready-to-use media for vitrification and thawing of human embryos. GM508 Cult-Active is a bicarbonate-buffer­ed reagent designed to investigate oocytes of patients with failed fertilization after previous Intracytoplasmatic Sperm Injection cycles. GM508 Cult-Active is designed to investigate if fertilization failure after previous ICSI-cycles is due to a deficient oocyte activation.